A. Georgios is the name given to two different villages in Corfu island, both along the west coast, but one is in the north, while the other is in the south. Here we’re speaking about the southern village called also with the English name of St. George. It’s a small and relaxing place developed along the coast with both sandy and rocky coves. This is not one of the most tourist villages of Corfu, but it’s ideal for families and couples that are looking for a quiet place. From Aghios Georgios it is also possible to visit Korisia lake, located a little bit to south and which is surrounded by a particular environment. It seems a desert area with sandy hills, bamboo plants and where the silence is the only sound you can hear. The lake is inhabited only by herons, wild ducks and Mediterranean birds. For all those who like walking there’s a village, Argyrades. Argyrades is not so far and is not a tourist place like Aghios Georgios, but the life here is still simple with small streets that remind the ancient Venetian occupation in Corfu. 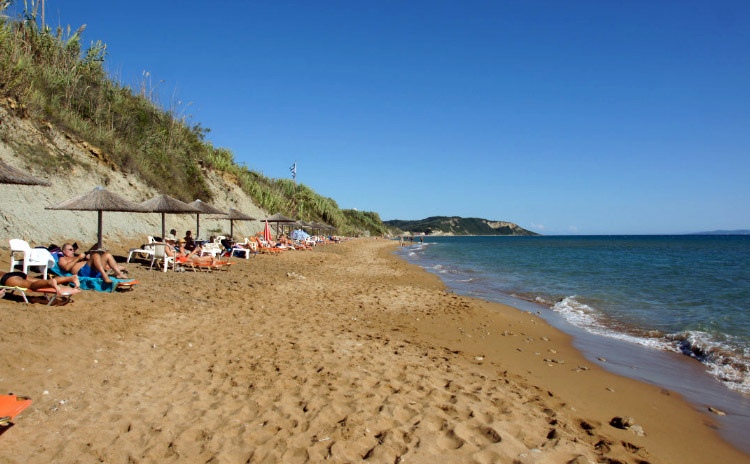 Aghios Georgios is a small village developed on the sea, with several sandy beaches well equipped for tourists. All the beaches are delimited by the coast road, but they’re divided from this one by a huge green nature. The southern beach of the village is sandy, is longer than wider and it’s ideal for children as the sea here is not very deep. There’s the possibility to rent boats and to practice water sports as windsurf and ski-jets. In Aghios Geogios you can rent jeeps, cars or motorbikes at reasonable prices. You can also take a boat for rent to discover this part of Corfu coast. In Ag. Georgios you can find many kinds of shops like supermarkets, souvenir shops and everything else you may need. During the night, after a good meal in a traditional Corfu restaurant, you can relax drinking a cocktail choosing one of the several pubs. If you’re looking instead for a crazy night you must go to Kavos village, just few kilometres to the south. Agios Georgios is a small-size village but offers also some tourist accommodation like apartments and studios.